In June 2016, an international team of 31 astronomers caught a massive star as it died in a titanic explosion deep in space. The blast of the dying star released in about 40 seconds as much energy as the Sun releases over its entire lifetime, all focused into a tight beam of gamma rays aimed by chance toward Earth. The gamma-ray blast on June 25, 2016, was detected by two NASA satellites that monitor the sky for such events, the Fermi Gamma-ray Space Telescope and the Swift Gamma-Ray Burst Mission. The team’s findings, reported in the scientific journal Nature, provide strong evidence for one of two competing models for how gamma-ray bursters (GRBs) produce their energy. The MASTER-IRC telescope at the Teide Observatory in the Canary Islands observed it first, within a minute of the satellite notification. The telescope is part of Russia’s MASTER network of robotic telescopes at the Teide Observatory. It made optical light observations while the initial phase was still active, gathering data on the amount of polarized optical light relative to the total light produced. After the Sun set over this facility eight and a half hours later, the RATIR camera in which ASU is involved began observing. RATIR stands for Reionization And Transients InfraRed camera; it is mounted on a 1.5-meter (60-inch) robotically controlled telescope located on San Pedro Mártir Peak, at Mexico’s National Astronomical Observatory in Baja California. Butler is the principal investigator for the fully-automated camera. 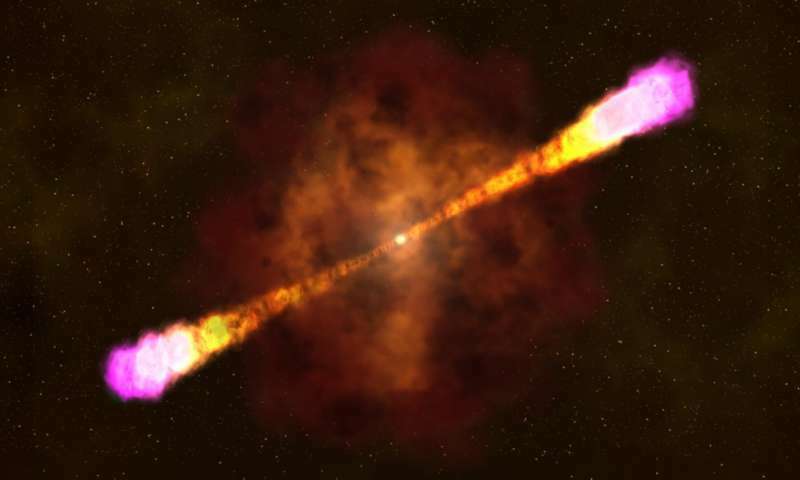 This image shows the most common type of gamma-ray burst, thought to occur when a massive star collapses, forms a black hole, and blasts particle jets outward at nearly the speed of light. While gamma-ray bursters have been known for about fifty years, astronomers are still mostly in the dark about how they erupt. Astronomers believe most of these explosions are associated with supernovas. These occur when a massive star reaches the end of its normal existence and blows up in a colossal explosion. A supernova throws off some of the star’s outer layers, while its core and remaining layers collapse in a few seconds into a neutron star or, in the case of highly massive stars, a black hole. 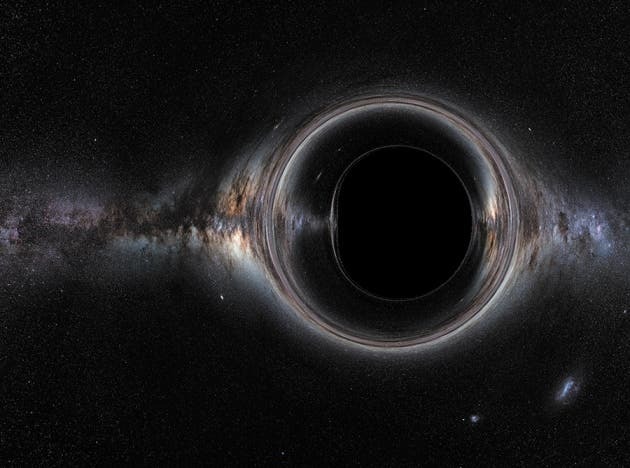 Beaming effects, Butler says, may result from the spin of the black hole produced after the supernova explosion, as it releases material along its poles. “We think the gamma-ray emission is due to highly energetic electrons, propelled outward like a fireball,” Butler says. Magnetic fields must also be present, he adds, and theories differ as to how the fields are produced and to what extent the flow of magnetic energy outward is important.